Posted by Katy Foley on September 20, 2018 at 10:30 AM. Filed under LED Lighting, Around the Home, Safety & Security . 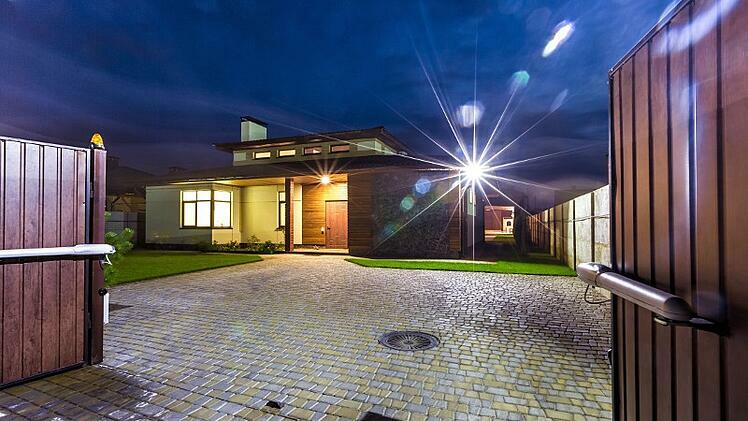 Most security lights serve one purpose- to provide bright, well lit surroundings. The GE-branded Enbrighten Security Light does this but also serves as an outdoor accent light as well. 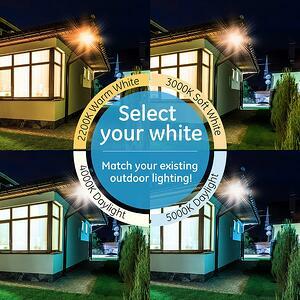 These outdoor security lights have custom settings when in accent mode to adjust the color temperature, such as warm white, soft white, bright white and daylight options to match existing outdoor lighting or specific needs. For example, the accent light is great for backyard areas and social gatherings because of its warm white setting that provides the perfect amount of illumination in a warm amber glow. The accent mode lowers the light level to 1,000 lumens which is just slightly brighter than a standard soft white bulb. Once in security mode, the brightness level goes up to 3,100 lumens (on the 3-head security light) of super bright daylight. 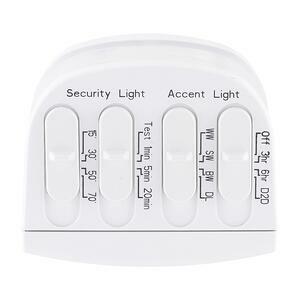 The Enbrighten Security Light offers a number of customizable settings. Not only can you select one of the four color temperature options, but you can also select a lighting schedule and detection range for your light. Varied timer settings allow you to select the evening accent light to be on around the clock from dusk-to dawn, or turn on at dusk and off three or six hours later, saving energy. You can set the accent light to be on in the evenings before bedtime, and then automatically change to motion sensing mode after dark when you're asleep. When it comes to security lighting, it's important to make sure your illuminating all the important areas around your home, such as pathways to your front door, backyard decks, or darker areas in your yard. This can be a challenge and sometimes and can result in having to purchase more lights so all your safety bases are covered. 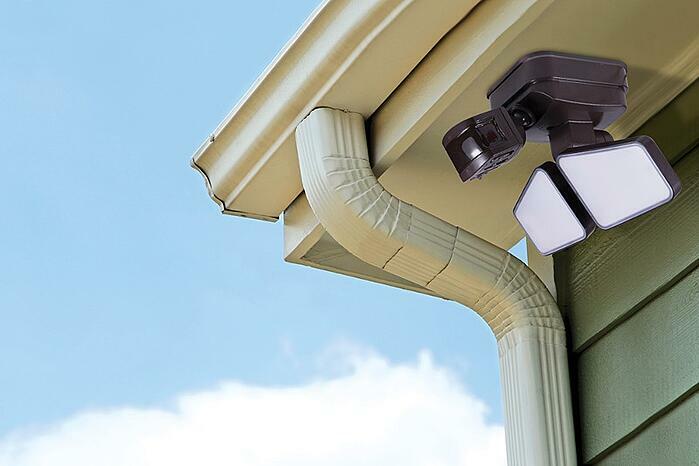 However, with a GE Enbrighten Motion Security Light that has a 240° motion detection area and up to 70 ft. detection distance, you can have a one-stop shop light that brings attention to a vast area. You can also program whether you want the motion light to come on when movement is detected at 15 feet, 30 feet, 50 feet or 70 feet and automatically turn off after 1 minute, 5 minutes or 20 minutes. 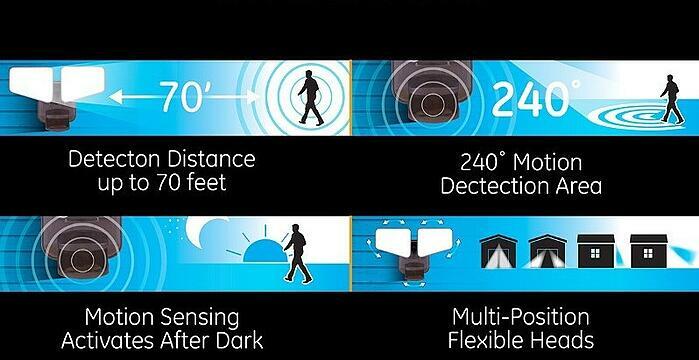 This is a really beneficial feature as some might only need 15 ft. detection if they live in a residential community so the light isn't blinding the neighbors who live close-by versus someone who lives in a rural area and needs larger coverage and even brighter light. Easy setup and installation is another important aspect for home security lighting – that's why the Enbrighten motion sensing LED lights were designed to be easily wired to any non-dimmable wall switch with its easy mount, quick connect system. You can mount these lights on the external walls or eaves of your home. After they are mounted, the multi-position, flexible heads can be maneuvered to aim the light directly at the desired outdoor area you wish to illuminate. To learn more about the GE Enbrighten Motion LED Security and Accent Lights, watch this overview video or shop below now!